Following research conducted a couple of weeks ago; today we publish a chart and a table detailing the DDR3 memory usage by overclockers at HWBOT. 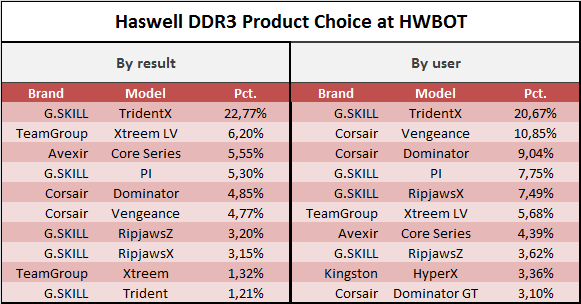 G.Skill remains the most popular DDR3 brand amongst overclockers, and TridentX the preferred choice for Haswell overclocking. 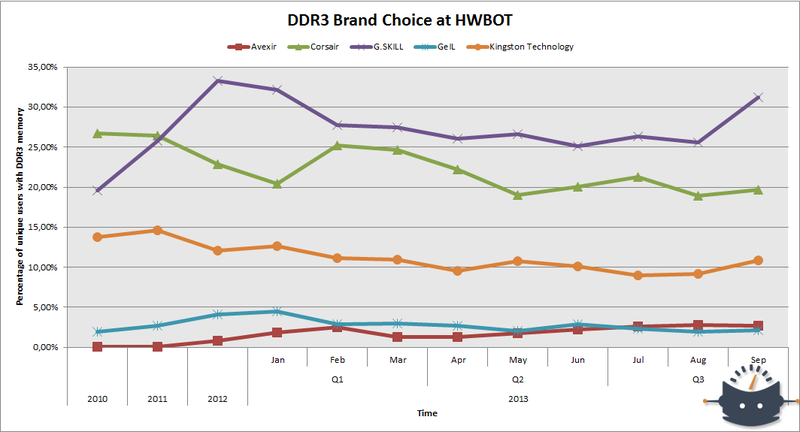 In terms of DDR3 brand choice, G.Skill has been the top pick since 2011. The chart is based on a data pool of 187,000 results, and displays the amount of users with at least one G.Skill-based overclocking result. We see a significant increase in usage during September, but events like this are not uncommon. US-based Corsair is still second, Kingston third. The other memory brands all have <5% usage rate. 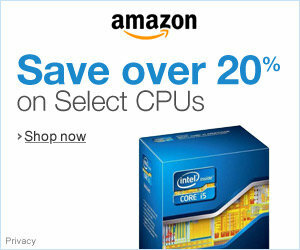 The table of top pick memory products is based on a data pool size of 4,500 results. It features two lists: list by amount of results, and list by amount of users. The difference can easily be explained. One user can submit results with various kits, but a result can only be linked to one product group. The sum of the result percentage will always be 100. The sum of the unique user percentage will be equal to or greater than 100. Users submitting many results with the same hardware will affect the list by results more. We see that G.Skill's TridentX kit is the current most preferred choice for Haswell overclocking. Both in terms of results and unique users.